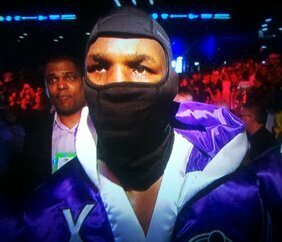 Ageless warrior Bernard Hopkins does it again! by Geoffrey Ciani – During the eighth round of the IBF light heavyweight title bout between reigning champion Tavoris Cloud and 48 year old challenger Bernard Hopkins, HBO commentator and boxing pound-for-pound superstar Andre Ward duly noted, “It’s not quantity for Hopkins, it’s quality—he makes every punch count”. That more or less sums up the nature of this fight. Another day at the office for Bernard Hopkins translated into another page in the history books, as he once again became the oldest boxer to ever win a major world championship—and he did so in style. It was yet another masterful performance from the Future Hall of Famer who at times made it look easy in dethroning the undefeated 31 year old Cloud via unanimous decision. The action began slowly, but right from the start Bernard controlled the pace and the range. Hopkins was simply brilliant at maintaining optimal distance, constantly shifting and maneuvering Cloud to his liking. As a result Cloud’s activity was totally hindered. Throughout the entire encounter Cloud would have difficulty closing the gap, and he was also frequently off balance and out of position. This forced him to eat more shots and punch less, and when Cloud did throw he was usually either overextending or quickly smothered. Hopkins effectively used his feet to create angles and dictate Cloud’s movements, which enabled him to sneak in leather of his own with varying frequencies of power and volume against his befuddled foe. This all spelled disaster for Cloud, who was ultimately broken down both physically and mentally as matters progressed into the later stages. To be sure, Cloud had some moments along the way and landed some thunderous blows. For the most part, however, Hopkins’ sturdy chin withstood their impact without noticeable effect, barring a few times where he smirked at Tavoris as if to acknowledge, ‘you got me with that one’. In addition to landing some bombs upstairs, Cloud also at times had success to the body against Hopkins, but he inexplicably never sustained focus on the older challenger’s midsection. More often than not Hopkins was able to deflect, evade, and otherwise stifle incoming fire. With his ability to skillfully command the action, Hopkins contained Cloud while remaining inside his comfort zone without being pushed too hard or too fast. Hopkins kept things on his terms. This victory, like so many before it, was largely the result of hard work, dedication, and extremely good pre-fight preparation. It is something Bernard Hopkins and his team of surrounding boxing minds led by Naazim Richardson have made into an art form. They draw up a game plan that affords Hopkins the best chance to utilize his biggest strength—his boxing IQ. This is what enables Hopkins to continue to defy Father Time for so long. He is 48 years old—forty-eight! He had his first professional boxing match when Ronald Reagan was still President of the United States. Physical skills and athleticism deteriorate with age, and mental strength and determination can oftentimes get older fighters into trouble. With Hopkins, he of course still has talent and the physical tools and abilities required to compete and succeed at the top level, but it is his knowledge and understanding of both boxing and his own limitations that are the real driving force behind his prolonged success. From selecting relevant opponents he matches up favorably with to developing and fine-tuning fight strategies and back-up plans, Bernard Hopkins’ boxing IQ extends itself to important matters that happen outside the squared circle, long before a fight takes place. Combined with his abilities to execute, adapt, trap, disguise, improvise, and when all else fails, to find a way—Hopkins is one of the most unique and amazing specimens the sweet science has ever seen, and that was all on full display with his impeccable execution tonight. This history making upset might not be the most memorable performance in Bernard’s long and illustrious career, one which is largely defined by his celebrated success as an underdog, but considering his age and the dominant nature of the win, it is still remarkable and certainly deserves to be added to the list that includes Felix Trinidad, Antonio Tarver, Kelly Pavlik, and Jean Pascal. With Hopkin’ tremendous record breaking display of dominance, it is not unreasonable to believe that he actually could still be competing and winning at the championship level beyond 50, especially when one considers Hopkins’ intelligent calculations and behind the scenes legwork that enable him to enhance his still growing legacy. Next boxing news: Hopkins The Master Does It Again, Takes Another One To School! You are here: Home / Boxing News / Ageless warrior Bernard Hopkins does it again!